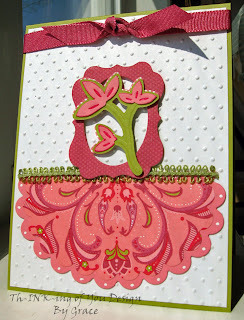 This is a quick card I made for my blogger group Ocean 11's Challenge #3.... which was to use dry embossing on our card. My first thought was that I had just received my SU! order with the "Sweetest Stem Embosslit Die". This cute little folder both embosses and die cuts. I had wanted it to use with the Rasberry Tart DP. When I started playing with it I had a little trouble liking what I was getting with a single color cut out, so I cut two out of Regal Rose, and one out of Kiwi Kiss. I outlined one of the rose colored flower sets with my SU! marker, then cut along the embossed lines. I cut another and glued just behind the kiwi layer, to give a bit of depth. On that layer I added white dots with my Signo Gel Pen. I should have let them dry better before mounting them but being in a hurry, I didn't wait. Oh well. I cut ovals with my Nestabilities from both Regal Rose and the Rasberry Tart DP, then a small Nestabilities frame from the same DP set, different print. I used Kiwi Kiss for my base, cuttlebug embossed a GPW layer in the bug, then added my layers. The frame and flower are both up on pop dots. The ribbon is a rasberry ribbon I had in my stash, and the green trim also was in my stash. No stamping on this card at all, though there is room for a sentiment later. This was a simple card except for futzing with the die cut. I did however come up with a couple other ideas for this little flower so hopefully it wasn't time wasted. LOL! So I think I'm caught up on my blogger challenges after being gone! Thanks for taking a peek and have a wonderful day! I love the rasberry tart paper!! The embossing sizzlit is cute. Nice elegant clean card!! Great dry embossing!! Thanks for sharing!! Very pretty, Grace! I really like your design! This is simply gorgeous! What a unique layout! Love it! Just beautiful! It was good to see you yesterday and yes, the flower on my card is the EK Success What of a Punch Daisy. I meant Whale of a Punch - it's early and my fingers aren't awake yet.